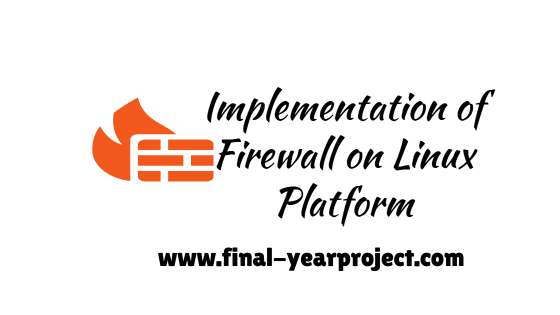 This is a good Computer science project report on implementation of firewall on Linux platform. The IP firewall facilities in the Linux kernel provide mechanisms for accounting IP packets, for building firewalls based on packet-level filtering, for building firewalls using transparent proxy servers (by redirecting packets to local sockets), and for masquerading forwarded packets. You can also Subscribe to FINAL YEAR PROJECT'S by Email for more such projects and seminar. A firewall protects networked computers from intentional hostile intrusion that could compromise confidentiality or result in data corruption or denial of service. The IP firewall facilities in the Linux kernel provide mechanisms for accounting IP packets, for building firewalls based on packet-level filtering, for building firewalls using transparent proxy servers (by redirecting packets to local sockets), and for masquerading forwarded packets. The administration of these functions is maintained in the kernel as a series of separated table (hereafter referred to as chains) each containing zero or more rules. There are three builtin chains which are called input, forward and output which always exist. All other chains are user defined. A chain is a sequence of rules; each rule contains specific information about source and destination addresses, protocols, port numbers, and some other characteristics. Information about what to do if a packet matches the rule is also contained. A packet will match with a rule when the characteristics of the rule match those of the IP packet. Each of the firewall rules contains either a branch name or a policy, which specifies what action has to be taken when a packet matches with the rule. There is also C programming for firewall which is included in the report. Use this seminar report for your reference and study only.